Open up your App.xaml. We have to merge in three dictionaries. The first two are to set up your Material Design colour palette. The MaterialDesignColors assembly contains a ResourceDictionary for each color (a collection of hues and accents). To create a full palette we need to bring in a primary colour, set up some hue brushes, and then bring in a secondary color for our accent color. 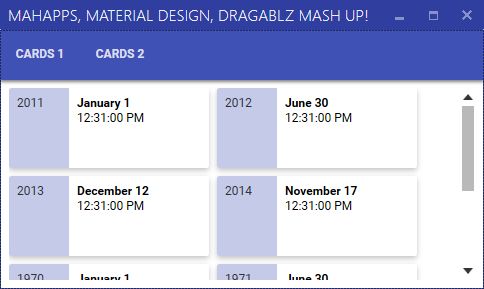 The third resource dictionary is to include the Dragablz theme for Material Design. Finally we instruct our tab control to use the correct style. include three hues from the primary palette (and the associated forecolours). Do not rename, keep in sequence; light to dark. And that’s it. Fire up your baby and you are done. You can change the colours by changing the two colour resource dictionaries which are referenced. You can also tweak the hues, but do not change the brush names. Dragablz will be looking for these. Dragablz is more than just a Chrome style TabControl for WPF. Via it’s Layout control it provides docking and tool windows. Taking the tool windows a step further, they can be used to provide an MDI effect in WPF. Even better, the MDI environment can reside inside a tab, which, when coupled with Dragablz other tear out and docking features can provide very rich UI Window management for the user. FloatingItems – allows any items to be floated on top of the Layout’s content. FloatingItemsSource – allows any items to be floated on top of the Layout’s content. MDI, operating within a tab. Dragablz is getting quite feature rich now, so I have created a demo project to illustrate it in use with another UI library, MahApps. If you haven’t used MahApps with WPF, it’s a great Metro/ModernUI style and control library to bring your apps bang up to date. Off the bat, if you are going to use Dragablz and MahApps together you will have to make a decision: use the MahApps MetroWindow, or the Dragablz DragablzWindow (or indeed your own)? Each option has its advantages. Primarily; MetrowWindow is a rich Window, with flyouts & custom Window commands, and the DragablzWindow supports transparency to provide a better dragging effect. See the two gifs for illustration of this point. Code and XAML-wise there is very little difference. The demo project on GitHub shows that very little change is required to use Dragablz and MahApps together regardless of how you choose to do it. 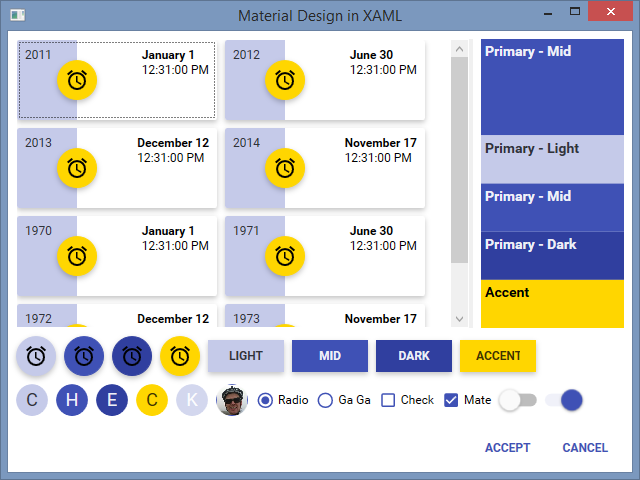 It’s also worth checking out the app.xaml to illustrate some of the styling info required. In making the Dragablz library I quickly realised I needed be able to push the tabs higher up the window as we see in Chrome, and also, to achieve the IE affect, I really needed Window transparency. Therefore I introduced DragablzWindow. But this only partially works with Windows Snap. The Window will snap; left, right, top/maximised. But you cant drag the maximised window down to restore it. So I had to blend some aspects of WPF and WinApi to achieve the full effect. We must now handle the sizing manually, based on how the user drags the thumb around. It’s worth seeing the source code to see how that’s handled. And, all of the cool tab features of Dragablz! The DragablzWindow is part of the Dragablz project on GitHub. And the style is here. Time for another quick look at what’s happening with tool windows in Dragablz. You can now take a tab, tear it out, and then drop it straight back in, but as a tool window…neat! The tool window can then be popped out, back into a first class window and tab control of it’s own. At some point I will try and get floating tabs on the tool window layer, so you can organise even further, but still in the user-friendly manner I am trying to push in Dragablz. Also, soon I hope to create a nice demo app mixing in a Modern UI theme courtesy of MahApps, demonstrating how to really re-ignite the power of desktop apps, so keep an eye out. If you like this library please help motivate me and star it on GitHub! The Dragablz feature set is come together nicely now, it’s more than just a Chrome style tear out tab control. Much more. I just quickly wanted to provide a look at the way the DragablzItemsControl can be used to generate a tool window effect. As always, there’s more to come!